Top Drives mobile game is a free-to-play card collecting video game that is from the Racing, Arcade, and Automobile genres. The game was developed by Hutch Games Limited, a company that’s based in London. The top Drives mobile game mobile card game was released on August 29th, 2017. It draws its inspiration from a favorite family card game. The game was mainly developed for those who are enthusiastic about racing and cars. The game is available on both AppStore and Google Store for iOS and Android devices. There are more than 700 real life cars for collection, comparing, and competing with other players. You need to master the stats well enough so that you can come up with your very own racing deck. In the game, the player needs to collect a given number of cards, build up a team, and set the team up for completion of various events and races. The cars are from the most common and well-known car companies such as Nissan, Ford, and Chevrolet as well as the Hummer. The races and events are happening all over the globe from Tykkimaki in Finland to West Coast USA. Irrespective of the part of the world from which a player is racing, they have to go head-on against other vehicles. The modes include G-Force Tests, Indoor Karting circuits, and Drag Races. It’s very important that you learn and know your cars well enough. There are more than 700 car cards some of which you’ll just sell off as soon as you get them. There also exist different races and a player ought to know the most suited cars for each race. As much as it is enjoyable to be collecting cars, the main aim of the game is to progress through it. To get through the levels, your deck must be well-established and clear the levels faster. The slots for cars in your garage are quite limited and therefore, it’s important to have fast accelerating cars for the drag races, good grip cars, cars with the ability to perform well in dusty or sandy terrains and cars that move well in rainy conditions among others. The player also will need to upgrade all the cars in their decks. For example, the Rare cars that are highlighted in blue should constantly be upgraded. Every car has 24 slots of the upgrade. In order to earn more rewards, you can replay each location. You can earn any number of the three available stars. This depends on your performance in the race. Another important reward for a player is to get the Boss Car. If you take the boss head on and beat them, you get to take their cars. Along the way, as you play, the player earns dollars and gold. These are used for buying card packs as well as upgrading cars. With dollars and gold as well as stars, you can upgrade your cars constantly so that you compete better. There are a number of exciting race scenarios which include hill climbs, drag strips, and race circuits. There are multiple types of surfaces and weather effects such rainy weather, dusty and sandy effects, among others. 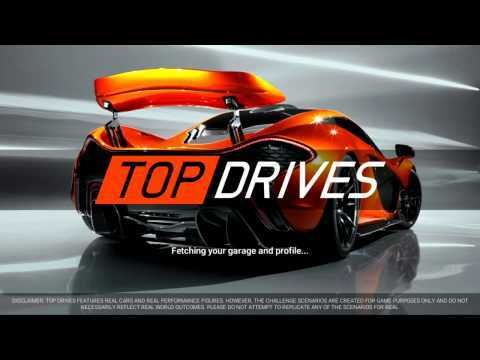 Top Drives is an amazing game for car enthusiasts. It gives a picture of the real cars that players would love to race with.